This guide is aimed primarily at people who have never bet on sports before, and know very little about what's involved. It contains all the information needed to get started, with everything explained in a manner that's very easy to follow. 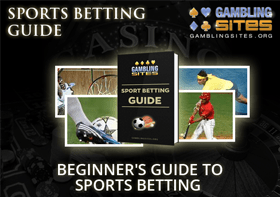 Even those who already have some experience of betting on sports may find the guide useful, as it's very comprehensive with a lot of helpful advice. There are a few different parts to this guide. The first part features a number of articles that are all about the basics of sports betting. These cover topics such as the mechanics of sports betting, how to place wagers, and the roles of probability and odds. The next part contains some advice for when you first start betting, and includes some useful resources for beginners. There's a glossary of sports betting terms, and an FAQ. Finally, there's a collection of articles explaining all about the various types of bets and the different forms of betting. Everything that's included in this beginner's guide to sports betting is listed below. If you're a complete novice then we'd recommend reading through everything in order, but you can skip to anything that is of particular interest if you prefer. Also on this page is some additional information about some other sports betting sections on our website. These are useful if you want to expand your knowledge and improve your betting skills, and there's some advice for betting online as well. Sports betting is one of the more popular forms of gambling, because it offers a few advantages over many of the alternatives. In this article we look at its benefits when compared to playing casino games or playing poker, and also some of the other reasons why you might want to try betting on sports. Before you should even consider risking your own money, you should really understand the basic mechanics of how sports betting works. This article will teach you exactly what you need to know in order to start betting your money, including the three main components that make up a sports wager. Once you know how sports betting works, you can then think about placing some bets. In this article we explain what's involved in the process, and the various methods you can use. Telephone betting, bookmaker shops, casino sportsbooks, and online gambling sites are all covered. Odds are an integral part of sports betting, so you really need to understand them. This article does exactly that by explaining what they are and how they work, as well as also looking at their different formats. There is a guide to the math involved in calculating potential payouts when figuring out your returns. Bookmakers don't just make money by accident. They use specific techniques to ensure that they (usually at least) make a profit from every betting market that they offer. You need to be aware of these techniques, as they are the reason why bookmakers have the advantage over their customers. The concept of value and how it relates to probability is vital knowledge if you are to stand any chance of success when betting on sports. This article explains what you need to know in detail, and will give you a fundamental understanding of what it takes to identify good betting opportunities. The next two articles contain tips for what to do, and what not to do, when you first start betting. You should follow the advice featured in these articles from the moment you start betting. It will help you get into good habits, and greatly improve your chances of making money in the long run. There is little point in trying to become an expert on sports betting as soon as you start out. It can be hard enough trying to understand how everything works. As a beginner, it's important to focus primarily on just the basics. There are a few simple tips that are worth following though, and we've listed them all in this article. It's natural to make mistakes as a beginner to sports betting, and you shouldn't worry too much if you do. They are part of the learning process. With that being said, there are a few common mistakes that are actually relatively easy to avoid. This article provides some advice on how not to fall into the same traps that so many beginners do. We've also provided two additional resources which contain very useful information for beginners. There are several questions that we hear all the time from sports betting beginners looking for advice on getting started. We've compiled a list of the most common ones, and provided detailed answers to them in our FAQ. The following are some examples of the questions we answer. The answers to these questions, and more, can all be found on the following page. There are times when it can feel like sports betting has its own language, and this can make things very confusing for a beginner. Our comprehensive glossary can clear up any confusion, as it explains all the jargon and technical terms you are likely to encounter when betting on sports. It's not necessary to learn all the words and phrases contained in this glossary at this stage, but you might want to bookmark it to refer to any time you come across a term you don't understand. The following articles will teach you all about the different wagers you can place on sports events. You probably won't want to use all of these when you first start betting, but it's still advisable to understand all the available options and how they work. The first of these articles contains a brief overview of each type of bet, and you should read this one as a minimum. The rest of the articles explain each bet in more detail, with working examples. You can read them now, or refer to them at a later date when you are ready to start experimenting with different wagers. For some reason, a lot of people seem to think that betting on sports makes watching them less enjoyable. This is perhaps because they are under the impression that it means taking things too seriously, and worrying about things like statistics and form rather than simply relaxing and watching a game. Let us assure you that this is nonsense. You certainly can choose to take your betting seriously, and it may affect the way that you watch sports events, but it really doesn't take the fun out of things. It's quite the opposite in fact. In our view at least, placing wagers on events makes watching them even more enjoyable. It adds to the excitement, as it means there's always something or someone to cheer for. It's not essential to learn all about the strategy involved in sports betting, and indeed the vast majority of people who bet don't. They simply enjoy putting their sports knowledge to the test, and giving themselves the opportunity to win some money. We do recommend learning at least the basics of what to do, but they are all that's needed if you just want to have some fun and place the occasional wagers on your favorite sports. As fun as sports betting can be, it's important to recognize the fact that it does involve risk. It doesn't matter how much you know about sports, you're never going to be able to predict the outcome of events with 100% accuracy. Even if you mostly back big favorites, there's still going to be the occasional upset where things don't turn out as expected. Risk is a part of any form of gambling, so don't let this put you off betting on sports. It's just that you need to be prepared for the possibility of losing money. Most people do lose money overall, and there's a good chance that you will too. This is why you must gamble responsibly. You should set a budget to bet with, and only ever use money that you can afford to lose. Even though most people lose money through sports betting, this doesn't mean that you have to. The bookmakers do have an advantage because they set the odds, but their advantage is not impossible to overcome. It's not like playing casino games where there is a house edge that cannot be beaten. There's still some luck involved of course, but there is no reason at all why you can't take from the bookmakers if you know what you're doing. If you plan on taking your betting seriously, and are aiming to make consistent profits, then you need to go a step or two further than just understanding the basics. Success takes hard work and commitment, and there's a lot to learn, but with enough knowledge and the right approach you can be a winner. The following two sections of our sports betting guide can help you to achieve your goals. The information in this beginner's guide is all relevant regardless of how you actually choose to place your bets. The advice it contains applies regardless of whether you bet over the phone, in a bookmakers shop, or with a casino sportsbook. Seeing as the most popular way to bet these days is over the internet, however, we've also produced a section dedicated to betting online. Check out our page that discusses both methods. This section covers each of the following topics, and also includes a step by step guide to joining a sports betting site and placing wagers. Additionally, and perhaps most importantly, we also recommend the top sports betting sites in several different categories. We'll help you to find the very best sites that are the most suitable for any personal preferences or requirements you may have. Each one of our recommendations is reliable and trustworthy, so you can be sure of a safe betting experience.